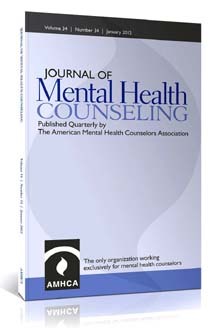 The Journal of Mental Health Counseling (JMHC) publishes articles on all aspects of practice, theory, professionalism, and research related to clinical mental health counseling. The American Mental Health Counselors Association consists of clinical mental health counselors (MHCs), educators and supervisors of MHCs, and researchers interested in advancing knowledge and practice in mental health. Therefore, articles should include a detailed discussion of implications for clinical mental health practice. The JMHC is divided into four sections: Practice, Theory, Professional Exchange, and Research. Although separate descriptions follow, overlaps between sections may naturally occur. MHCs work in a variety of clinical settings with diverse client populations. Cutting-edge strategies and techniques as well as innovative applications of established clinical practices are emphasized in this section. Critical analyses of the existing literature and descriptive application of clinical approaches, strategies, and techniques are essential. This section allows for dialogue among MHCs regarding dilemmas, challenges, divergent perspectives, and other emergent topics relevant to clinical mental health counseling. Points of view should demonstrate an understanding of historical precedents and opposing viewpoints, be grounded in the professional literature, and provide well constructed arguments. This section provides MHCs with information related to empirically supported best practices, evidenced-based approaches, and new developments in clinical mental health counseling. JMHC accepts for publication both qualitative and quantitative studies. Thorough support for the research should be provided through a detailed literature review. Manuscripts should also clearly delineate the research questions and methodology (i.e., description of the participants, IRB approval, variables and instruments, and data analyses). For quantitative studies of evidence-based treatments, methodologies that allow for comparisons among treatments and control for threats to validity will be given priority consideration. For quantitative manuscripts, authors should report effect sizes; reporting confidence intervals can also be helpful. Authors must describe the clinical significance of the results. All research manuscripts should include implications for professional MHC practice and future research. Manuscripts typically should not exceed 25 pages, including references and tables. Margins must be at least 1 inch on all sides, and all content must be double spaced. Times New Roman is the preferred typeface, with 12-point font size. The title of the article should appear on the first page of the manuscript. The article title should be as short as possible. The abstract should be between 125 and 150 words in length and clearly summarize the main ideas of the manuscript. References should follow APA style. Check all references for completeness and accuracy including year, volume number, pages of journal citations, and, if available, the digital object identifier (DOI). Make certain that all text references are listed in the reference list and vice versa. For other style questions, consult the APA Publication Manual (6th ed.). Consult the APA web site (www.apa.org/journals/webref.html) for additional information regarding the correct format for electronic references. Do not use footnotes. Instead, incorporate this material into the text. Keep tables to a minimum. Include only essential data and combine tables where possible. Refer to the APA Publication Manual for style of tabular presentations. Each table should be on a separate page following the reference section of the manuscript. Final placement of tables is at the discretion of the Editor; in all cases tables will be placed near the first reference to them in the text. Include figure legends on a separate sheet. Authors must reduce bias in language against persons on the basis of gender, sexual orientation, racial or ethnic group, disability, or age by referring to the guidelines in the APA Publication Manual.